This Physician’s Weekly feature covering the transitioning from pediatric to adult diabetes care was completed in cooperation with the experts at the American Diabetes Association. During childhood and adolescence, diabetes care gradually shifts from being supervised by parents and other adults or guardians to self-care management. “Preparation for this transition by patients, their families, and healthcare providers is essential,” says Lori Laffel, MD, MPH. Studies have shown that there are often significant gaps in diabetes care for patients as they transition to adulthood for many reasons. These include competing social, emotional, educational, and occupational needs as well as differences in the systems of care for pediatric and adult patients. “With the increasing occurrence of type 1 and type 2 diabetes in childhood and adolescence, more young people with diabetes will require a framework of care and education that prepares older teens and emerging adults for successful self-management and a seamless transfer to adult diabetes care providers,” Dr. Laffel says. 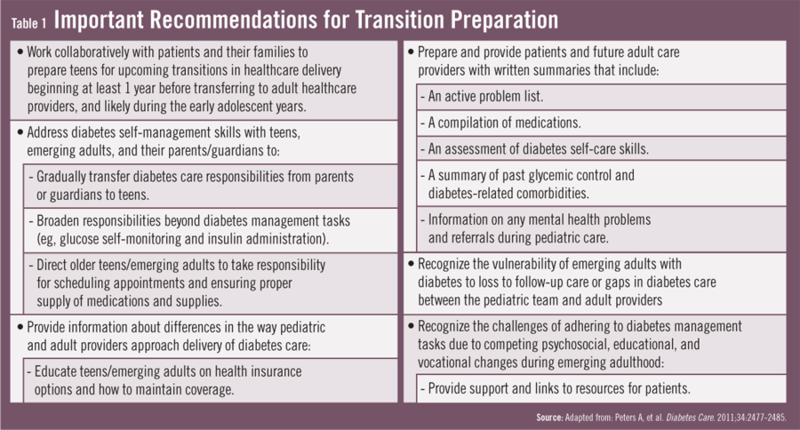 In the November 2011 issue of Diabetes Care, the American Diabetes Association published a position statement on managing diabetes for emerging adults transitioning from pediatric to adult healthcare systems. The position statement was co-authored by Dr. Laffel and Anne Peters, MD, CDE, on behalf of the Transitions Working Group. The work group included representation from experts in several other medical associations and societies, including the CDC, the Endocrine Society, the American Association of Clinical Endocrinologists, and other well-respected organizations. Pediatric and adult endocrinologists, primary care providers, diabetes nurse educators, dietitians, exercise experts, mental health professionals, and others were part of the collaboration. The position statement recommends that pediatric healthcare providers begin the process of transition preparation with sufficient time prior to transfers to adult care. For example, during the early teen years, there may be a gradual shift from exclusive parental responsibility for the youth’s diabetes management to shared responsibility for diabetes management tasks between parent and teens. This would then be followed by a further acceptance of diabetes self-management tasks by the older teen for blood glucose self-monitoring and insulin delivery. Additional tasks associated with self-care (eg, scheduling follow-up diabetes appointments, obtaining diabetes prescriptions, and picking up supplies) need to be shifted to emerging adults (Table 1). When the time comes for the pediatric patient to transfer to an adult provider, the pediatric team can help in this process by providing transitioning patients and new adult providers with written summaries of care issues along with medication lists (Table 2). Special attention should be paid to screening at this time for diabetes complications, disordered eating behaviors, and mental health issues (eg, anxiety or depression). Providers should have open discussions with emerging adults regarding birth control, drug and alcohol use, smoking, STDs, and planning for pregnancy because these behaviors and issues link closely with healthful living with diabetes. Currently, there are no proven strategies for transition that ensure the best transition in order to prevent short- and long-term complications and maximize lifelong functioning. “There is no ‘recipe’ that works best for everyone,” Dr. Laffel says. “Several promising approaches may help with the transition process, including patient self-care education and skills training, provision of specialty transition clinics that include both pediatric and adult providers together, or use of transition coordinators.” Ongoing and expanding research initiatives are needed, including efforts to identify and train adult providers who are versed in the medical care and psychosocial needs of emerging young adults with diabetes. Peters A, Laffel L; the American Diabetes Association Transitions Working Group. Diabetes Care for Emerging Adults: Recommendations for Transition From Pediatric to Adult Diabetes Care Systems: A position statement of the American Diabetes Association, with representation by the American College of Osteopathic Family Physicians, the American Academy of Pediatrics, the American Association of Clinical Endocrinologists, the American Osteopathic Association, the Centers for Disease Control and Prevention, Children with Diabetes, The Endocrine Society, the International Society for Pediatric and Adolescent Diabetes, Juvenile Diabetes Research Foundation International, the National Diabetes Education Program, and the Pediatric Endocrine Society (formerly Lawson Wilkins Pediatric Endocrine Society). Diabetes Care. 2011;34:2477-2485. Available at: http://care.diabetesjournals.org/cgi/pmidlookup?view=long&pmid=22025785. Weissberg-Benchell J,Wolpert H, Anderson BJ. Transitioning from pediatric to adult care: a new approach to the post-adolescent young person with type 1 diabetes. Diabetes Care. 2007;30:2441-2446. Dabelea D, Bell RA, D’Agostino RB Jr, et al. Writing Group for the SEARCH for Diabetes in Youth Study Group. Incidence of diabetes in youth in the United States. JAMA. 2007;297:2716-2724. Court JM, Cameron FJ, Berg-Kelly K, Swift PG. Diabetes in adolescence. Pediatr Diabetes. 2009;10(Suppl. 12):185-194. Nakhla M, Daneman D, Frank M, Guttmann A. Translating transition: a critical review of the diabetes literature. J Pediatr Endocrinol Metab. 2008;21:507-516. Anderson BJ, Edelstein S, Abramson NW, et al. Depressive symptoms and quality of life in adolescents with type 2 diabetes: baseline data from the TODAY study. Diabetes Care. 2011;34:2205-2207. Lori Laffel, MD, MPH, has indicated to Physician’s Weekly that she has received grant support from Bayer and served as a consultant for Johnson & Johnson, Lilly, sanofi-aventis, Bristol-Myers Squibb, LifeScan/Animas, and Menarini.